We recently swooned over a traditional, historic stone house upstate in Brewster, New York, and we’re now equally smitten with its modern counterpart in Barryville, just two hours away from Manhattan. 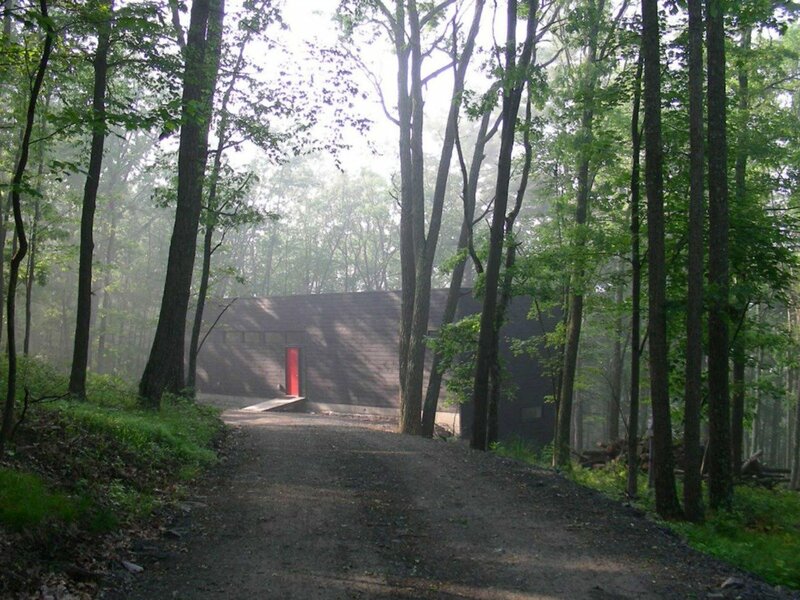 The RLW Cabin by Shadow Architects was built from the ground up on a sloping, woodsy lot. 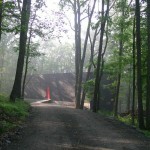 A LEED Silver-designated building, it features many environmentally friendly materials and building methods and keeps a simple form so as not to compete with the natural surroundings. 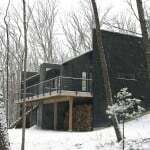 The 2,300-square-foot, rectangular cabin was conceived by owners Larry Cohn, Principal of Shadow Architects, and RJ Millard. 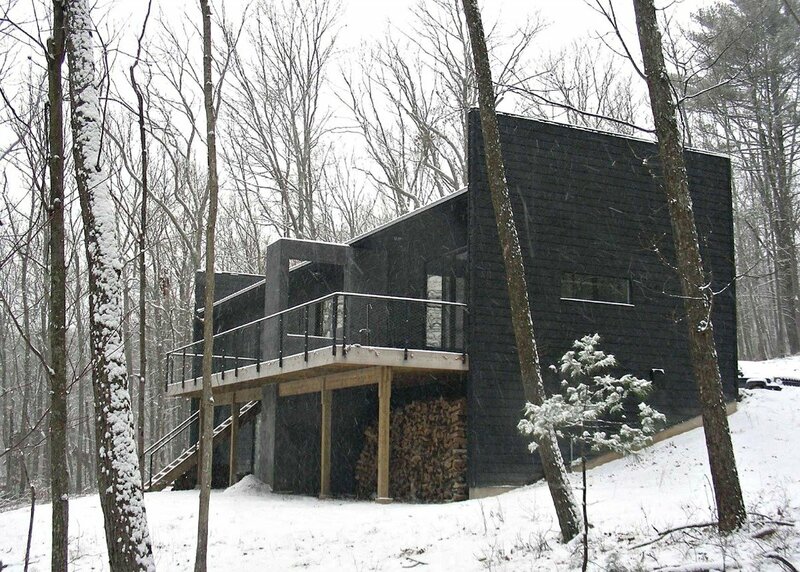 Their getaway home was inspired by a loft-style lodge in which they had stayed in Shohola, Pennsylvania. When the Barryville lot matched their ideas, the building commenced. 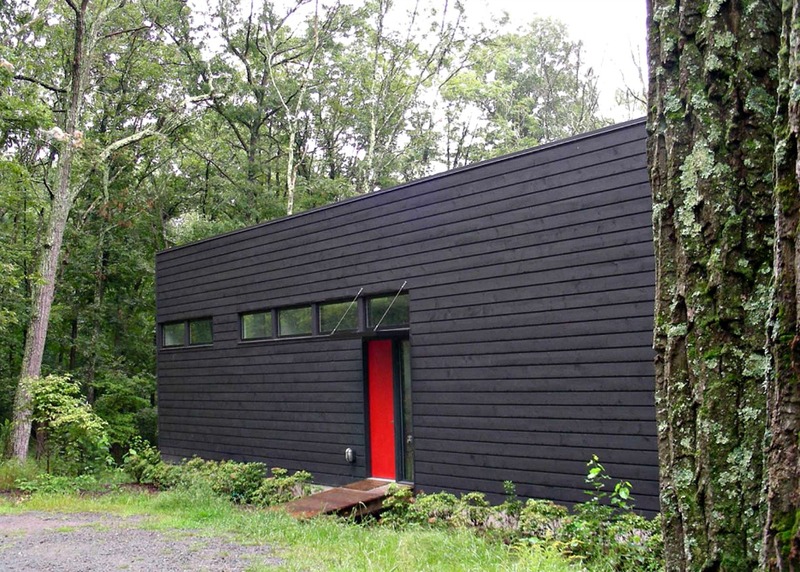 They chose the bright red door (a welcoming feature that the Stone House shares) as a simple finding device, and the dark wood siding was modeled after the color of pine tree bark in the rain. 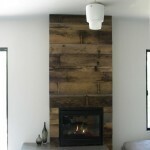 One of the home’s principals is its use of reclaimed and recycled materials. 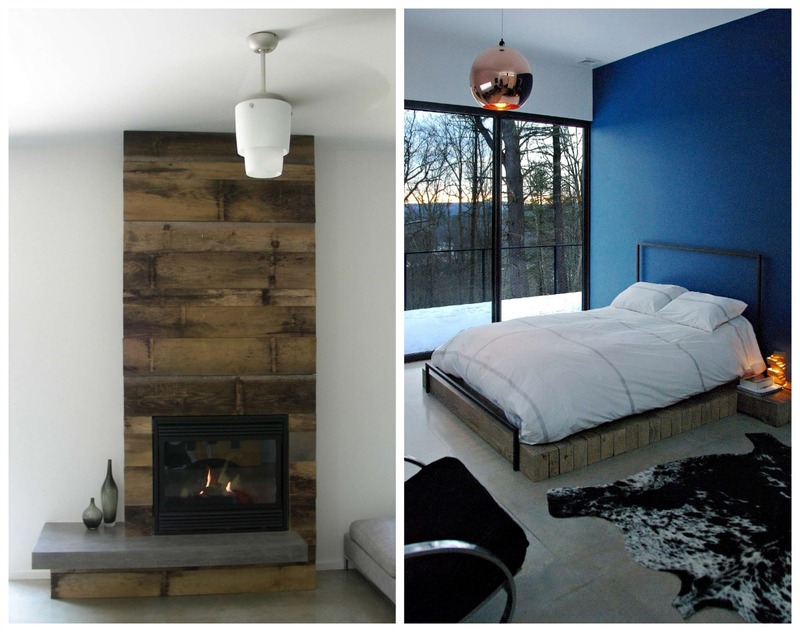 The bedrooms doors are salvaged from a NYC fire house; the fireplace wall and master suite bedframe are constructed from old barn lumber; the dining room table legs are antique finds; and the family room bar, an original 1970s’ Scandinavian piece, was picked up off the street in the city. 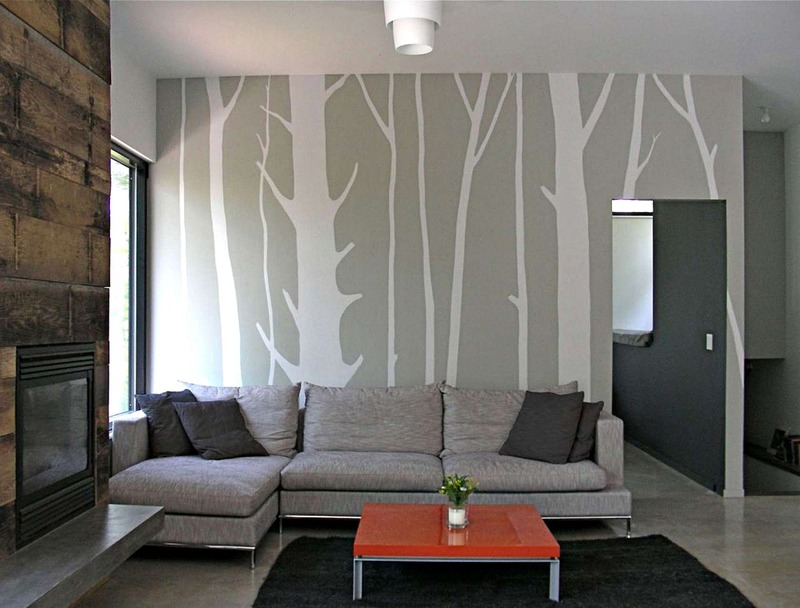 The eco-friendly interior design is elegant, contemporary and streamlined, using a calming color palette of pale gray, charcoal, and black with each room featuring a pop of one primary color. 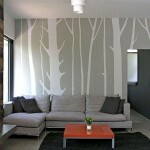 In the cozy living room, the subtle branch wall decals bring a bit of the outside in and serve as an interesting artistic addition. 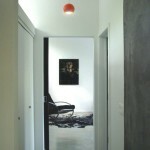 Throughout the space are polished concrete floors. A large concrete form surrounds the interior kitchenette and continues outside onto the deck. 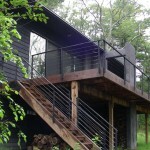 The structure divides the deck into two areas: a living room side with deck chairs and which can accommodate the rolling dining room table from inside; and on the other side an outdoor shower is partially obscured, but has open views of the forest. 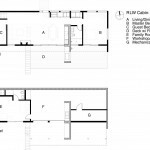 The cabin is situated on the lot so the longer wall sits on an east-west axis with southern-facing windows, allowing for the use of passive solar energy. In the winter when the sun is at a low angle, it shines far into the house, and the exposed concrete absorbs heat to warm the house at night. In the summer when the sun is higher, a roof overhang prevents overheating and alleviates the need for air conditioning. 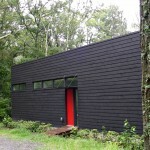 Additionally, the home has a radiant hot water system in the floors. 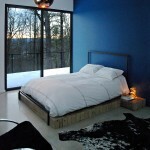 We think you’re probably getting now why we’re loving this modern getaway. Explore more of Shadow Architects’ designs. Savsd as a favorite, I really like your web site!